on the eve of the World Trade Organisation's (wto) meet in Seattle, Western environmentalists geared up to make their voices heard. They are urging the participating countries to go ahead with only those regulations that are environment-friendly. Western environmentalists believe that wto regulations do not conform to green standards and they are getting appeasement signals. Prior to the talks there was some good news for the Western environmentalists -- President Bill Clinton signed an executive order that will require a review of how future trade agreements made by the us would affect the environment. According to Clinton's order, the administration will assess the environmental impact of trade agreements and us positions at the wto; get inputs from the public and environmental groups and give technical help to developing countries trying to protect natural resources. To some extent this order has fulfilled what has always been a dream for us greens: formal standards and safeguards written into the rules governing the wto. 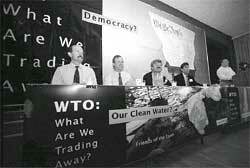 The wto, on its part, has also tried to appease the green lobby. In a soon-to-be published report obtained by The Economist, the organisation for the first time concedes that trade can harm the environment. The report says, "Sweeping generalisations are common from both the trade and environmental community, arguing trade is either good for the environment, full stop, while the real-world linkages are presumably a little of both, or a shade of grey." But developing countries, like India, see the inclusion of environmental standards in the wto regulations as veiled protectionist policies. This is because of their experience with us one-upmanship in two earlier cases. In 1991, a General Agreement on Trade and Tariffs (gatt) dispute regulation panel shocked us environmentalists by ruling that the embargo against Mexican tuna, imposed under the us Marine Mammal Protection Act violated the gatt agreement. Because the Mexican tuna fishing took place outside us waters, the panelists viewed the embargo as tantamount to us imposing its environmental values on the rest of the world. History repeated itself in 1996, when the us imposed trade restrictions on the import of shrimp and shrimp products from India, Thailand, Pakistan and Malaysia -- a measure undertaken by the us to protect and conserve sea turtles, an endangered natural resource. But, India argued that all aspects of conservation of sea turtles have to be relative to the past practices of each country. Only dealing with current mortality, fishing practices and projecting some data or standards from developed to developing countries is neither desirable nor practical. Prohibition of shrimp imports to the us does not necessarily save the sea turtles. Both Mexico and India won their cases against the us. Issues up for discussion before the 1,200-odd non-governmental organisations (ngos) include everything from genetically-modified crops to fishing subsidies to child labour. The European Union had already launched a new effort to get labour conditions on to the agenda but this was rejected by developing countries like India. By pushing their agenda of green laws, the Western greens cannot deny that they are indirectly promoting Western dictatorship over the developing world by using trade sanctions. This double standard becomes all the more evident, when the us' stand on climate change goes unpunished while the developing countries suffer. Some developed nations will also argue against the green laws. Greenland, a Danish colony, and other countries are likely to argue their cases somewhat on similar lines. Greenland's sealskin market took its first hit in 1972, when the us banned import of such products. Now hunters are fighting back. Contrary to what environmentalists say, harp seal is not an endangered species. Since, wto regulations prohibit countries from setting up barriers to trade in products from animals not endangered, the Greenland Home Rule Government is likely to use this argument to urge the lifting of the ban on seal product imports.